DHS Chief Visits U.S.-Mexico Border, Defends Administration's Asylum Rules A day after a federal court blocks the Trump administration from changing asylum rules, DHS chief Kirstjen Nielsen promises a legal fight. 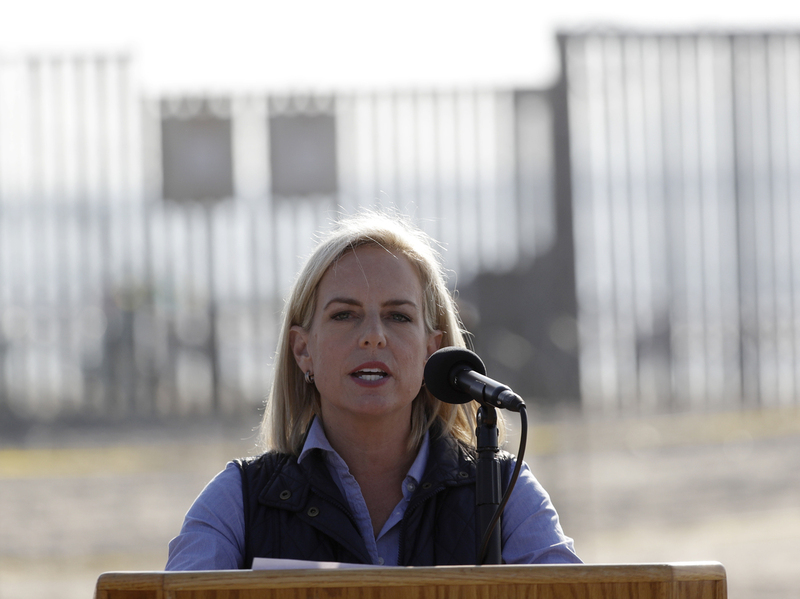 Secretary of Homeland Security Kirstjen Nielsen speaks in front of the border wall separating Tijuana, Mexico, and San Diego. Earlier this month, President Trump issued a proclamation requiring asylum-seekers to present themselves at ports of entry. The American Civil Liberties Union and other immigrant advocate groups filed suit challenging the administration. They argued that federal law clearly allows a migrant inside the U.S. to seek asylum regardless of how they entered the country. In his ruling, Judge Tigar essentially agreed. "Whatever the scope of the President's authority, he may not rewrite the immigration laws to impose a condition that Congress has expressly forbidden," said Tigar, an Obama appointee. Nielsen said the administration will appeal "as quickly as possible." Such an appeal would first be filed with the U.S. 9th Circuit Court of Appeals. Earlier in the day, President Trump, in remarks to reporters at the White House, called the liberal-leaning appellate court "a disgrace" whose judges are "very unfair." Nielsen appeared at the border to underscore the administration's commitment to keeping migrants out of the U.S.
"This is a border wall with row upon row of concertina wire," Nielsen said. "Make no mistake, we are very serious. You will not get into our country illegally." She also criticized media reports for portraying the migrant caravan now entering the border city of Tijuana, Mexico as a sympathetic group made up mostly of women and children. In reality, she said the majority are single, adult or teen-age males and that U.S. authorities have "identified over 500 criminals to include known gang members contained in the flow of the caravan." She did not say how American officials identified the reputed gang members. "This is not an organic flow of migrants," Nielsen concluded.